Monrovia Now: News and Comment about Monrovia, California: Poems on Sidewalks; Cooling Room; SGV Cities Interested in GoMonrovia; Etc. Poems on Sidewalks; Cooling Room; SGV Cities Interested in GoMonrovia; Etc. ~ Monrovian Kathee Bautista penned the verse shown above. 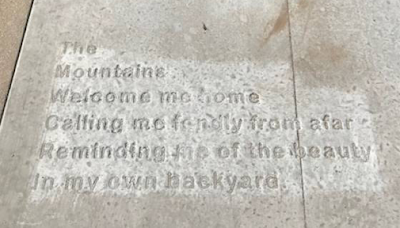 It is the first resident sidewalk poem in Monrovia's Art in Public Places Committee's sidewalk poetry program. It's at 238 West Palm Ave.
~ A hot weekend is predicted, so a cooling room will be available at the Monrovia Community Center at 119 W. Palm. It will be available July 5-9, from 8 a.m. to 9 p.m.
~ A bunch of San Gabriel Valley cities is sponsoring a meeting to discuss the city's pioneering GoMonrovia transportation program on July 11 at 3 p.m. at the Monrovia Library Community Room. City staff and representatives of Lyft and LimeBike will be there to explain the details.